A Brighton driver has paid a high price for ignoring a ticket from Sussex Police with a one-year ban and a bill for more than £1,700. Farshad Nasirpour, 53, of Ship Street, Brighton, denied one charge of failing to tell police who was driving his Land Rover when an offence was committed. He was convicted and banned from driving for a year, fined £416 and ordered to pay a victim surcharge of £41 and court costs of £625. The former restaurant boss admitted a similar offence on another date and pleaded guilty to speeding along Ditchling Road in Brighton. Nasirpour, who used to run the Italian restaurant Piccolo, was fined £277 for withholding the driver’s details and £185 for speeding and ordered to £85 court costs separately in each case. 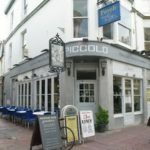 Piccolo went into liquidation in late 2014, owing the taxman more than £170,000. A charge of jumping a red light in Old Shoreham Road, Hove, in his Porsche Cayenne was withdrawn at Horsham Magistrates’ Court. Nasirpour, who has also had addresses in Palmeira Square and Barrowfield Drive, in Hove, was handed a bill totalling £1,714.